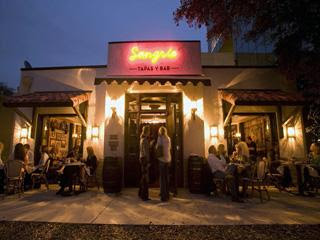 I love you, Sangria tapas bar. Let me count the ways: 1. Sparkling Sangria (men, you will like this better than the normal sangria. Just order it. If you don't, your girlfriend will, and then you'll wish you had her drink.) 2. Bottomless Sangria during weekend brunch. That's right. They just keep filling your cup. 3. Ceviche. The best I have ever had. Not too 'limey'. Not too complicated. Tender. Fresh. Delicious. (Hot-Pocket loving sister gave this two thumbs up.) 4. Fried Calamari. It is lightly breaded, so it still feels like a fresh seafood dish. Next time you're in Dallas, swing by this place and add to my love list.